Some time ago, Rob @ RS Autosports noticed his NSX was starting to act a little strange, it would sputter, back fire, AFR’s were swaying more then usual so he called me up and we put the car on the dyno and I started to analyze the data logs trying to determine what the issue might be. What I noticed is that all the sensor inputs from crank/cam, to IAT, CLT, MAP were fluctuating by rather large amounts in fractions of a second. This being a car on a speed density ECU means that the signals the ECU is depending on to deliver accurate spark and fuel to is compromised and could potentially lead to a very large problem. After comparing the latest logs with previous logs, I’ve noticed the latest logs were showing that the inputs were far more noisy then ever before and while almost anyone who has worked with a V1 AEM will know they’re quite known for odd quirks and not always running 100% this was far too odd to just brush off and forget about. The next part was obviously setting up the AEM software wise. Of course this being an application that AEM didn’t offer on the market there was no support from AEM at all, and only dealing with plug and play AEM ECU’s before that meant a learning curve for us in getting into the nitty-gritty of AEM’s deepest settings. And if you’ve ever used an AEM you’ll know there are literally thousands of individual settings that have to be checked and adjusted. Once that was figured out, the next part was understanding how AEM interprets crank and cam signals, and of course how it all relates to now running the NSX on full sequential fuel and ignition compared to the old waste-spark setup. Once the car was running, it was then time to sync the engine timing to the ECU, that proved to be an issue since what we didn’t know is that using the factory timing loop and certain timing guns there were issues with getting a correct reading. Most guns from the Snap-On family were effected apparently and of course using two different Snap-On timing light models we can fully agree with this information. The solution? Isolate cylinder number one directly between the coil pack and the spark plug using a good old fashioned spark plug wire. That allowed us to finally dial in and setup the sync between the ECU and the motor with perfect accuracy. A few minor tweaks and the car was running like a dream, far smoother and crisper then it ever has on the AEM V1. It was time for the ECU to get its initial tune dialed in on the dyno. Shortly we were right on track with the power figures from last time, seeing about 490whp on 94 pump gas with approx 9 psi boost from the 4088R, with part throttle and driveability also dialed in nicely the new ECU is really leaps and bounds better then the old, dying ECU that it replaced. Of course we both knew that the car was just so well equipped to deal with the current power levels, and was just begging for more and so more it got. I started to dial in the AEM’s closed loop boost control for a set point of 1 BAR and we adjusted the dials on the AEM meth controller to add some safety to this high compression stock 160k km motor, and a few pulls later there we were, staring at a beautifully round figure of 601whp with an impressively flat torque band of 412wtq from about 4700-8500 rpm. Spool was kept somewhat conservative for obvious reasons. 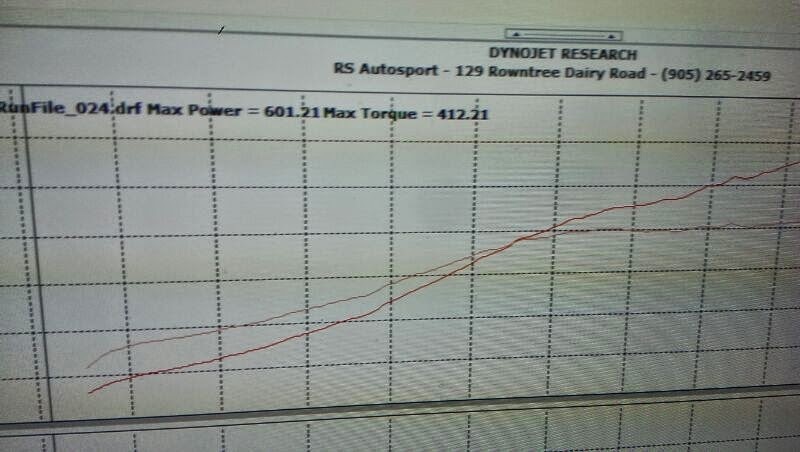 Sorry for the crappy pic of the dyno monitor, I’ll get a proper screen shot and update later some time to see the full curve.